Pam and Karen (family of late Graeme Boler, both members of The Rotary Club of Sutherland), Jay Thorogood from the Rotary Club of Darling Harbour and Dr Lamorna Osborne from the Rotary Club of Sylvania. Rotary Clubs supply the solar lights to areas of countries in need. 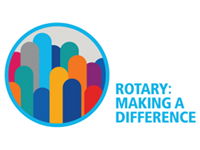 RSL sells the lights to other Rotary Clubs and ‘Friends of Rotary’ to work within their own projects. It is a wonderful and rewarding to see the success of the lights around the world, as we work together.